This post is on the importance of doing your homework before you start any home improvement project. I recently received a call from a person who had started remodeling their kitchen and received a stop work letter from the city in which they live. This was a simple case of not knowing the rules and regulations that the city imposes on construction work within its limits. They had decided to remodel their kitchen themselves in order to make the process more affordable. They ordered cabinets from a local cabinet company and had friends and family begin demolishing the kitchen. By the time the old kitchen was completely removed, the city posted a "stop work" order and referred them to the building department. Generally if a county or city catches someone in the process of construction without proper filing and permitting they will issue a stop work order until the person properly records and permits the construction work. Permitting is of course fee based but receiving a stop work order can often result in additional fines. They quickly found out that there are specific documents and guidelines that they should have followed in order to complete a kitchen renovation. They also found out that the condo association where they live does not allow homeowners to do the work themselves and that they would have to hire a licensed contractor. This is where Investcove Properties comes in. They called us in a panic and asked if we could help. We met with them and began the permitting process (which should have been started prior to the remodel). The problem with this is that permitting can take up to six weeks depending on the jurisdiction and in the meantime these people had no kitchen! We could not continue the work until all of the permits were issued. After we received the permits (approximately two weeks later) we scheduled one of our crews to begin work on the kitchen. Here is where another problem arose. The company that they purchased their cabinets from measured the kitchen incorrectly. This poses a very difficult problem. When purchasing a semi-custom kitchen it is imperative that all measurements are accurate. There are pieces called "fillers" that help to create a custom look by filling in areas that need to be spaced in order to properly fit the space. 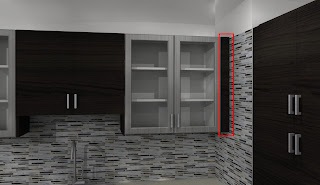 When there are gaps in the cabinets and the fillers are not installed you will see air between the cabinets. In this situation not only were the cabinets measured incorrectly but the company did not provide adequate fillers. This is an example of a cabinet filler. In this situation the semi-custom cabinet width did not mount flush with the wall so a filler was used to complete the space. The people in this situation simply wanted to upgrade their kitchen while saving money. They purchased the cabinets from wholesale cabinet company (i.e. $999 10' x 10' kitchen) and had the intention of doing the work themselves. Because they did not do their due diligence prior to starting the work the project ended up costing them far more than they anticipated in both permitting and legal fees and installation labor. In addition, because the cabinets were not measured properly it forced an imperfect kitchen installation. We did our best to adjust the cabinets and make the kitchen look as complete as possible but without the proper fillers and correct measurements it is next to impossible to do so without additional custom work. 1) Determine whether or not the work you are considering requires a permit. 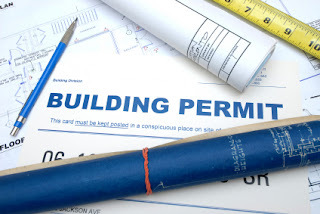 Most work does require a permit so it is important to properly document the work prior to beginning any remodel. You can do this by contacting your local City or County office, explaining the work you are considering, and inquiring on the permitting process. 2) Determine whether or not you can actually do the work yourself. If it is something that seems beyond your scope then call up some contractors, get some estimates, and save money until you are ready. 3) If you purchase materials from an outside vendor it is imperative to ensure that the measurements are accurate. A contractor who comes in to install the materials but does not order them will not take responsibility for items that are ordered incorrectly. When you order materials through the same contractor who installs them they will always guarantee their accuracy but when you order from a separate source it is that company's responsibility to correct their mistake.